EDITOR’S NOTE: Updated March 2017 with a few more products. Everyone likes Chinese food, but takeout can get expensive. 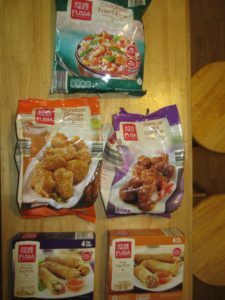 Fortunately, Aldi offers several Regular Buy Chinese options such as chicken, egg rolls, and rice and an array of rotating Special Buys such as pot stickers, specialty chicken, and specialty egg rolls. Even better, many of Aldi’s Chinese products contain no MSG or trans fat. This Regular Buy item is sold in a bag in the freezer section. It consists of “tempura white meat chicken in a zesty Asian-style sauce.” It’s a lot of fried chicken pieces covered in sauce with a slight kick. General Tso’s chicken is baked for 18-20 minutes in a 400-degree oven. The sauce thaws in a bowl of hot water while the chicken bakes. This is a tasty meal that is similar to the Chinese food you might order from a restaurant. My kids certainly like it, and it goes well with a side of rice. This Regular Buy item also is sold in a bag in the freezer section. It consists of “tempura white meat chicken in a tangy mandarin sauce.” Like General Tso’s chicken, this meal is composed of fried or breaded chicken pieces covered in sauce. This is baked for 18-20 minutes in a 400-degree oven. The sauce thaws in a bowl of hot water while the chicken bakes. The Mandarin Orange Chicken tastes similar to the General Tso’s Chicken, but with less spiciness. It’s a good choice if you want takeout-style food. This is another Regular Buy item that is sold in a bag in the freezer section and includes “rice, sugar snap peas, carrots, onions, and egg in a gourmet teriyaki sauce with white chicken meat.” It advertises having no added MSG, except for a small amount naturally occurring in soy sauce. The preferred preparation method is cooking everything but the sauce in a skillet for 10 to 12 minutes. While the veggies and meat are cooking, the bag of sauce thaws in a bowl of hot water, and you add the sauce just before serving. There are directions for preparing the fried rice in the microwave as well. This fried rice makes a good dinner side or a main lunch course. These are Regular Buy items sold in boxes in the freezer section. Four egg rolls come in one box, with a few small packets of sweet and sour sauce included. They bake for 16 to 20 minutes in a 400-degree oven. They also can be microwaved or cooked in a deep fryer, but I always bake ours. I’ve learned that every Chinese food restaurant does egg rolls a little differently, so there is no real standard for the perfect egg roll. Aldi’s egg rolls are as good as most Chinese takeout egg rolls, so they are winners in my family. The recommended preparation method is to cook the contents of the bag on a skillet for 10 to 12 minutes, while the sauce packet thaws in a bowl of hot water and is added just before serving. The bag also includes directions for microwaving the meal. This dish can be a complete meal, perhaps for lunch, or it makes a good side dish for dinner. It tastes pretty good. This chicken has nice zest and just the right amount of sweetness. 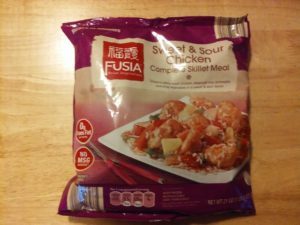 It may be my favorite among all the frozen chicken-with-sauce Chinese options Aldi sells. The Crispy Tempura Chicken bakes for 18-20 minutes in a 400-degree oven. While it bakes, the sauce packet thaws in a bowl of hot water. When the chicken is done baking, you drizzle the sauce over the chicken. The sauce is never warm enough for my tastes, so I usually put the sauce-covered chicken in the microwave for about one minute to heat it up. It’s such a brief time, it doesn’t seem to make the chicken soggy. You can serve the chicken atop stir-fry veggies or rice if desired. This meal is a bit of a curiosity when you open the package and pour the frozen contents into a heated skillet. You’ll see the shrimp and veggies (although it’s light on the promised mushrooms), but no noodles, and several round light brown spheres. It turns out, the brown spheres are little bundles of lo mein noodles covered in frozen sauce. As the food cooks, the sauce melts and the noodles appear. This shrimp lo mein tasted fine, but the sauce seemed a little on the thin side. The shrimp lo mein cooks in a skillet over medium heat. The package says it takes only 6 to 8 minutes, but it took more like 15 to 20 minutes for my meal to fully cook. The shrimp come raw, so be sure they are fully cooked before you eat this. I wasn’t as impressed by this meal as I hoped. It was okay for frozen Chinese food, but there wasn’t a lot of chicken, the vegetables such as carrots and bell peppers — having been frozen — were not crisp as advertised, and the rice turned out a bit mushy. To prepare, remove and thaw the sauce packet under warm water and set aside. Pour the rest of the bag’s contents into a large skillet along with 2 tablespoons of water. Cook for 7-8 minutes. Reduce heat and cook covered, stirring occasionally, for 5-7 minutes or until heated through. Stir in sauce and cook until all is heated thoroughly. This meal was a little underwhelming, like its above-mentioned cousin, the Sweet & Sour Chicken Complete Skillet Meal. It was skimpy on the chicken and consisted primarily of semi-mushy rice and vegetables. To prepare, remove and thaw the sauce packet under warm water and set aside. Pour contents of the bag into a large skillet along with 1 tablespoon of cooking oil. Cook for 7 to 8 minutes. Reduce heat and cook covered, stirring occasionally, for 5 to 7 minutes or until heated through. Stir in sauce to taste and cook until all is heated thoroughly. 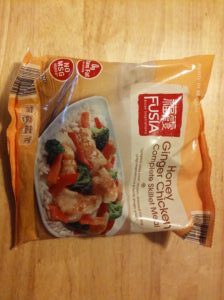 I’m not much of a sweet and sour chicken fan, but this tangy chicken is decent and seems to have a more distinct flavor than many of Aldi’s similar Chinese chicken-with-sauce options. The chicken bakes for 18 to 20 minutes at 400 degrees while the sauce bag thaws in a bowl of hot water. As with the Crispy Tempura Chicken, you drizzle the sauce over the cooked chicken, and I put the sauce-covered chicken in the microwave for one minute to warm the sauce. Serve the chicken atop stir-fry veggies or rice if desired. 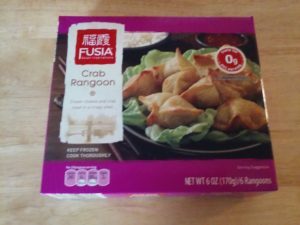 This is a popular takeout food, and Aldi’s Special Buy version consists of “cream cheese and crab meat in a crispy shell.” These are sold 6 rangoons to a box in the freezer section. These taste best if they are baked in the oven at 425 degrees for 9.5-10.5 minutes on a baking sheet. The box also includes instructions for microwaving or deep frying. These crab rangoons were different from what we typically eat from takeout establishments. They contain real crab instead of the common imitation crab meat. They also contain slivers of carrot as well as onion and green onion. The filling had a light orange color when we bit into these rangoons, and I’m guessing the color comes from the carrots. These don’t taste bad, but just know that they are different from the usual restaurant crab rangoon. The potstickers are a Special Buy item sold in bags in the freezer section. They consist of “tender dumplings” filled with chicken or pork and vegetables. Cooking instructions have changed slightly over the years. Currently, they can be microwaved, pan fried, boiled, or deep fried. I always pan fry them in a large skillet, which takes roughly 10 minutes. The potstickers sometimes come with little packets of soy sauce that my family likes to use for dipping. 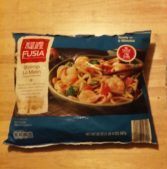 These are an excellent Chinese food option from Aldi and are one of my family’s favorites. This soup is sold in the freezer section. It comes in a little semi-hard plastic bowl covered with a peel-off plastic film, and it is packaged inside a cardboard case. The soup contains chicken broth, carrots, kale, sugar snap peas, a bit of cilantro, and about six chicken wontons or dumplings. This is a solid, satisfying soup. To prepare, remove the bowl from the outer cardboard container. Lift a small opening on the film cover and add water to the bowl’s fill line (approximately 5 ounces). Microwave on high for 4.5 to 5 minutes, then let stand for 1 minute before carefully removing the cover and serving. The package says this soup serves one person, but if you’re serving it as a side dish alongside other food, it easily serves two people. Because of its single-serving packaging and the fact that you can eat directly out of the bowl in which it is cooked, this is an easy soup to take to work for lunch if you have access to a microwave. Aldi’s Chinese food is a good, wallet-friendly substitute for takeout. Most products are outstanding, with only a few rare exceptions. Highly recommended. 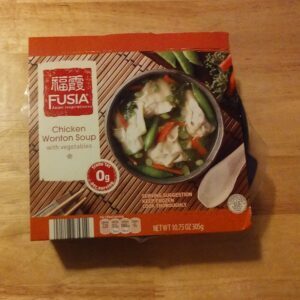 The Fusia Chicken Chow Mein was so good I wanted to get some more, but Aldi’s was out. 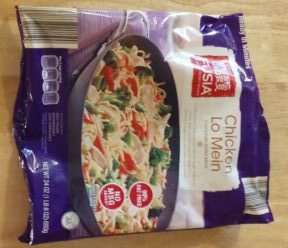 Chicken Lo Mein….Please go back to the old recipe. The new noodles…no good, the sauce salty …no sweetness not as flavorful as before. I loved it before, but not now! Thank you so much for these reviews of all these Aldi’s items. It’s been really helpful. Crab Rangoon is horrible. 6 Big dough pockets with nothing inside. I threw them away.